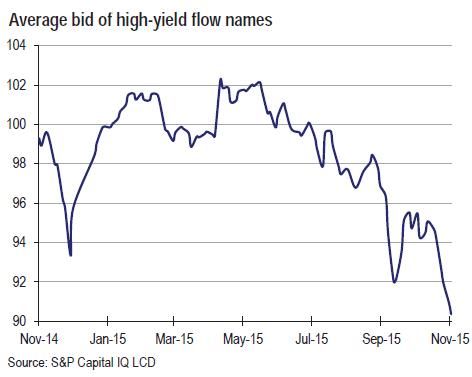 Energy junk bonds got broadly hammered. But Chesapeake Energy saw its $11.6 billion in junk bonds collapse on heavy volume, while its Credit Default Swaps (CDS) — which investors buy to protect against defaults — jumped to the highest level ever, signaling that the company is distressed far beyond its credit rating (BB, two notches into junk), and that a big downgrade is due. Its shares plunged 10% to $5.40, a 13-year low. “Market sources were divided over whether investors were capitulating on the credit or fast-money shorts were just taking advantage of the situation, S&P Capital IQ’s LCD HY Weekly reported. Chesapeake’s 6.5% notes due 2017 plunged 10 points to around 70 cents on the dollar, yielding about 30%, according to LCD. A months ago, they were still trading at 96.5 cents on the dollar, yielding 8.7%. Its 5.75% notes due 2023 plunged six points to about 42 cents on the dollar, down from 71 a month ago. Its $1.5 billion of floating-rate notes due 2019 fell about 4 points to 47. Its 5.375% unsecured notes due 2021 dropped the most, down 9 points to 41 cents on the dollar. Picking up energy junk bonds for cents on the dollar – that “lifetime opportunity” hedge funds have been promoting – has been a bloody trade. And now investors fear the worst. The company is staggering under a mountain of debt, most of it dating from the days of former CEO Aubrey McClendon. It’s burning borrowed cash like there’s no tomorrow, a strategy McClendon had perfected. And its assets are dissipating into thin air: it has already written off $15.4 billion over the past three quarters, with more write-offs to come! Other junk-rated energy companies and miners got hit too. But the mayhem was far broader. It didn’t help that Verso Paper, which is owned by private equity firm Apollo, threatened its creditors with a Chapter 11 bankruptcy filing earlier this week, because it didn’t have “sufficient resources to fund its most significant future cash obligations” and might not be able to “to continue as a going concern for the next twelve months.” Its 11.75% 1.5-lien bonds due 2019 dropped from 25 cents on the dollar on Friday to about 18 by Wednesday. With this sort of action spreading across the spectrum of junk-rated companies, the high-yield bond ETF HYG dropped nearly 1% on Thursday, more than annihilating the rally of the past two days, and now within a hair of the low point it hit on October 1, its lowest level since the euro debt crisis tore into bonds in October 2011. Some investors forecast that Chesapeake will have trouble meeting future commitments, including bond maturities and pipeline contracts, as it depletes its cash, said Tim Rezvan, an analyst at Sterne Agee & Leach Inc.
That has become a common survival strategy for cash-strapped over-indebted companies. Existing creditors get pushed down the capital structure by new money that comes as second lien debt. If the company restructures in bankruptcy court, they’re now facing much diminished recovery rates, if any. In other words, they’re getting fleeced. In anticipation, this debt gets demolished as the new risk gets priced in. It’s a ruthless strategy. Chesapeake announced on November 1 that it would amend its credit arrangement to allow for as much as $2 billion in new money to come in as second-lien debt, which would outrank all its $11.6 billion of unsecured junk bonds that Wall Street, under the Fed’s benign smile and soporific minutes, had suckered investors into buying. Now the $1.8 trillion US junk-bond market is bloodying investors – such as conservative-sounding bond funds that retail investors have in their retirement accounts and “alternative investments” that pension funds have become so proud of. Investors were lured into these bonds during the Fed-designed QE and ZIRP frenzy when they were trying to get a little extra yield in a world where central banks purposefully abolished yield, and so, fired on by the Fed and Wall Street soothsayers, they threw billions at the riskiest companies. And these billions have now gone up in smoke. Junk bonds are a leading indicator for stocks. So far, the S&P 500, as shaky as it is, has been propped up by a handful of the largest most liquid companies that due to the sheer magnitude of their market capitalization dominate the index. But beneath that superficial tranquility is a spreading world of turmoil and capital destruction. ← Recession Watch: Turning Point in Unemployment Claims? It’s like watching ice slowly melt off a house. Everything’s tranquil and then in the gleaming sun an icicle falls to the ground and shatters. Then you notice that the house is made of sugar cubes and is soaked but hasn’t quite yet started to fall apart. Gingerbread, anyone? Souffle is the term that comes to mind to describe the US economy. All puffed up and golden on the surface, with nothing but air below. Don’t forget they are going to hike rates in Dec! LOL! Here’s an old adage….that describes Chesapeake (and probably a bunch of others)……..you go broke slowly and then all at once. You are doing a yeaoman’s job; thanks. At least gasoline is cheap enough to make arson affordable. too much negativity, but yes, there are a lot of bad loans out there. i say invest in bankruptcy trustee futures.